Our bonded / swaged heatsinks are manufactured from either aluminum or copper metal sheets, or by using an extrusion process. Using either an epoxy or a solder / braze process, the fin is bonded to the base, hence the name bonded fin. The resultant bonded / swaged heatsinks are designed to meet very specific needs. Should you have any question about using bonded / swaged heatsinks, our knowledgeable consultants are available to discuss your specific needs and answer any questions you may have. It is important to choose the right product for cost, delivery time and effectiveness. The choice you make can crucial to your success. 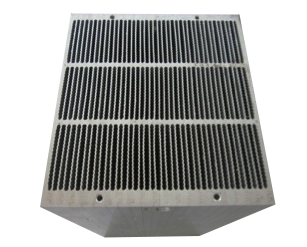 Bonded / swaged heatsinks are generally designed for high power application accompanied with low thermal resistance. Forced air cooling is required for these bonded fin products. A simple call or e-mail will put you in touch with the experts who have the answers you require.